Love is all you need, says this adorable new poster from MudHoney. I’m also lounging on the MudHoney Juliet Chair, that comes scripted with animations for cuddles, parents, child, and singles! There’s something for everyone in this lil chair, so you can sit by yourself or with the whole family. 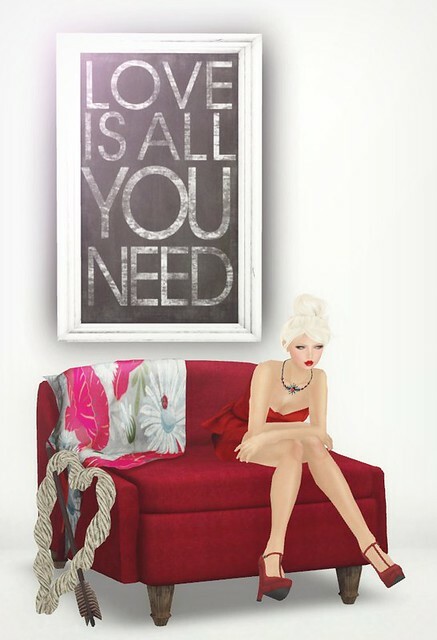 Get this furniture set & more at Juicy Crush On You event! BeetleBones – Be Mine Mini Dress (Red) mesh! You know..I always tell you everytime I see you in red dresses…this is your color!! And red lips..wow! !